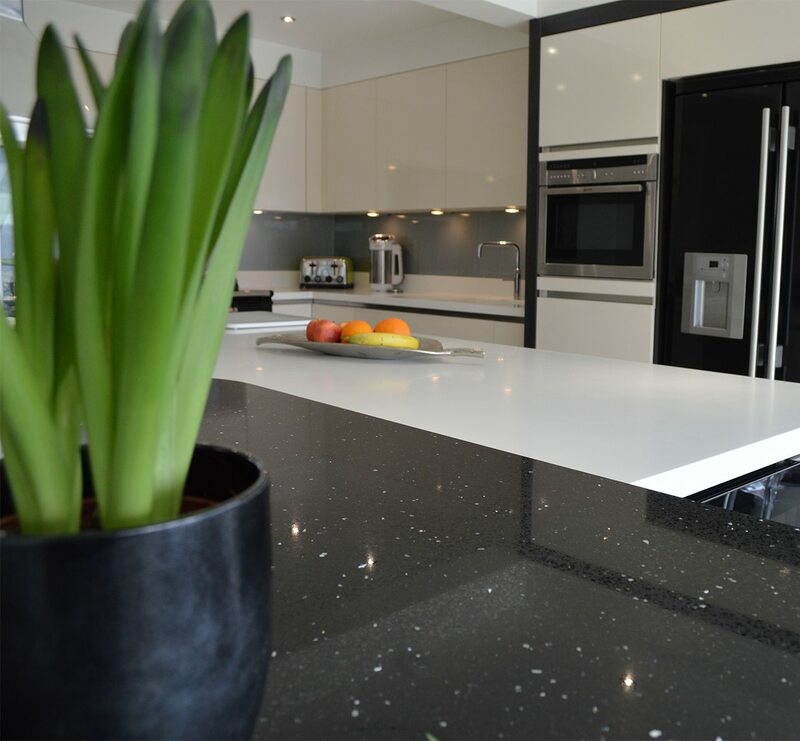 When Melissa Hargreaves saw an almost perfect design in one of our showrooms, it only took a few extra personal touches to make her dream kitchen complete. 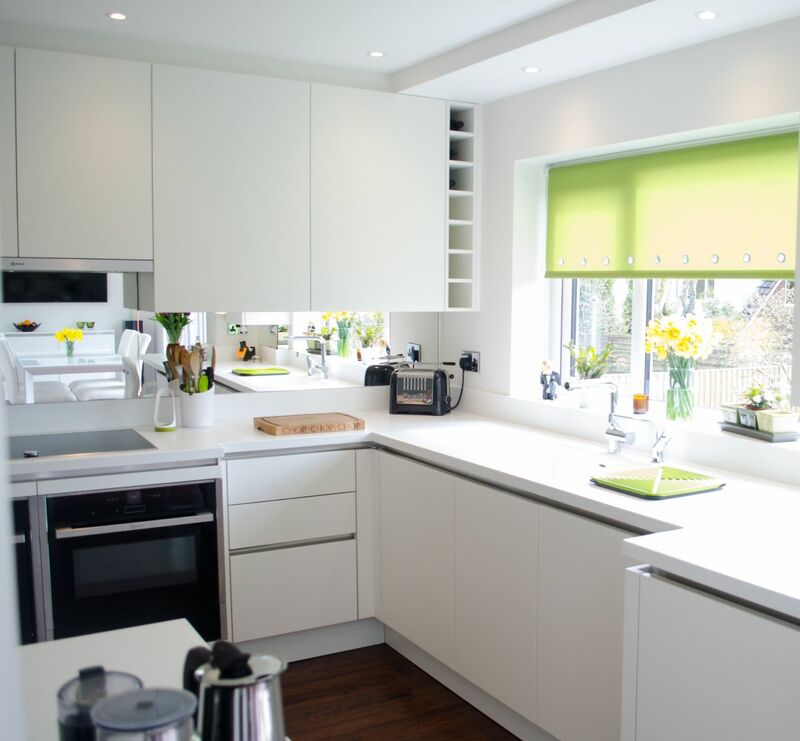 When Melissa started her first-ever renovation project – a sometimes challenging but rewarding experience – she already had a clear vision of how she wanted her house to look and feel. 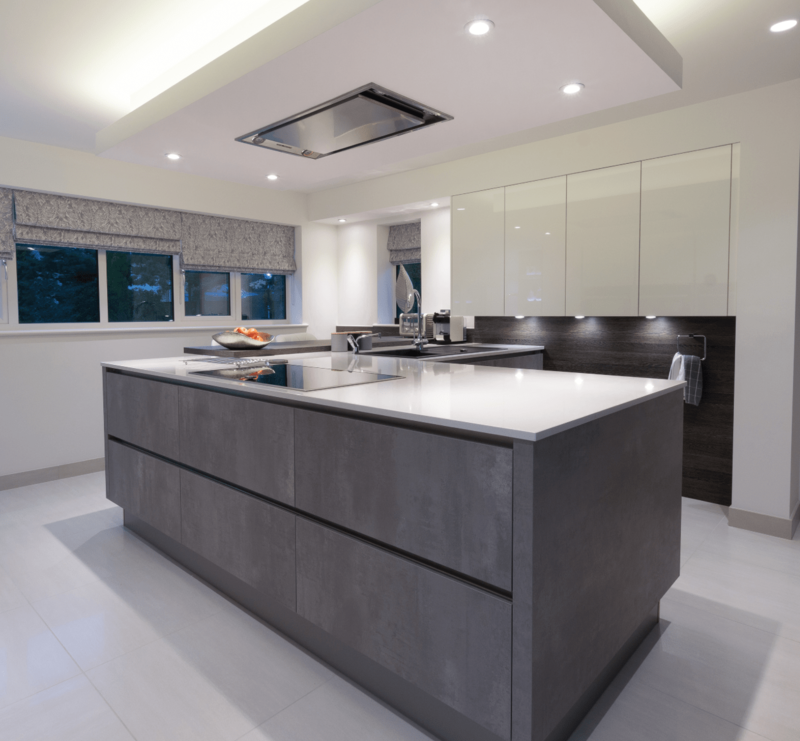 In her mind the kitchen was easy; the design brief was to create something that was versatile, efficient and well-equipped for living, cooking and entertaining alike. However, in her first designs other companies took a conventional approach and she was somewhat underwhelmed by their ideas. 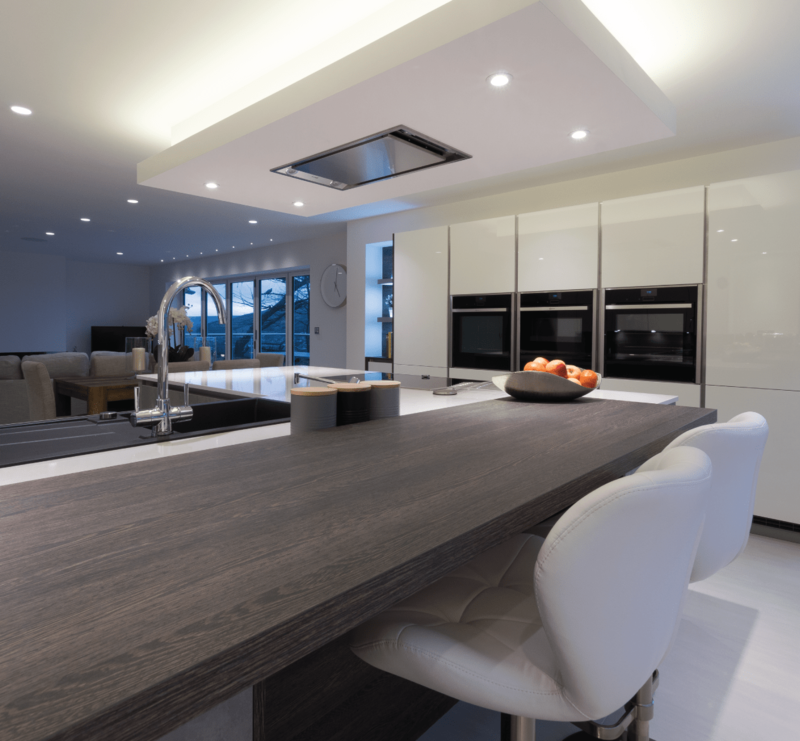 The finished product consists of an open plan space that’s cleverly designed and furnished to create three distinct areas: cooking, dining and relaxing. This layout gives Melissa valuable freedom to roam and makes the kitchen feel spacious but not sprawling, a feeling accentuated by its clean lines throughout. 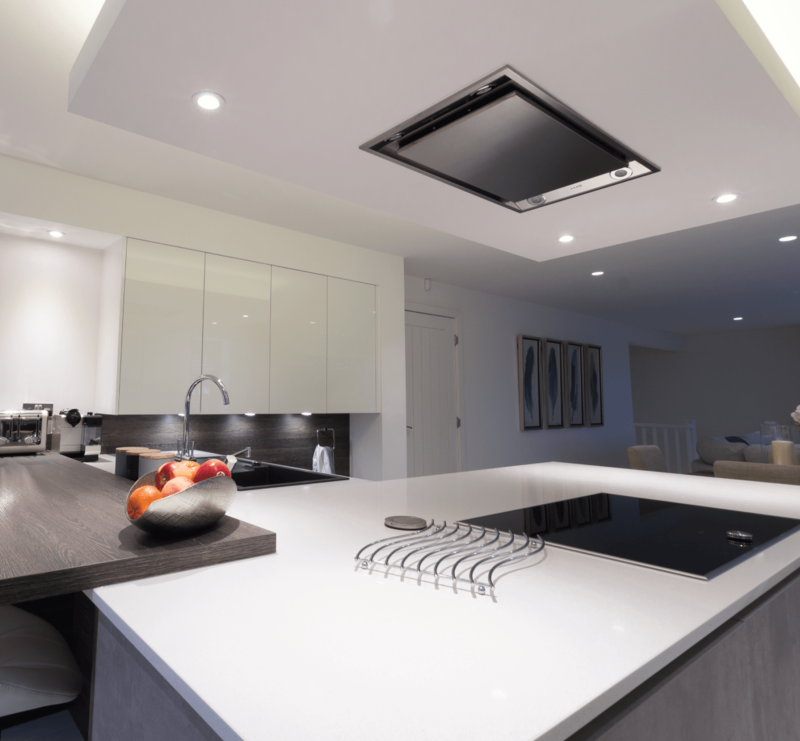 It features handleless cabinetry with storage areas that are neatly recessed into the walls, while a ceiling-mounted extractor provides quiet power and functionality without intruding on the clear line of sight between the cooking and dining area. The ceiling detail that holds the fan is also lined with LED mood lighting that further enhances the feel of the space. 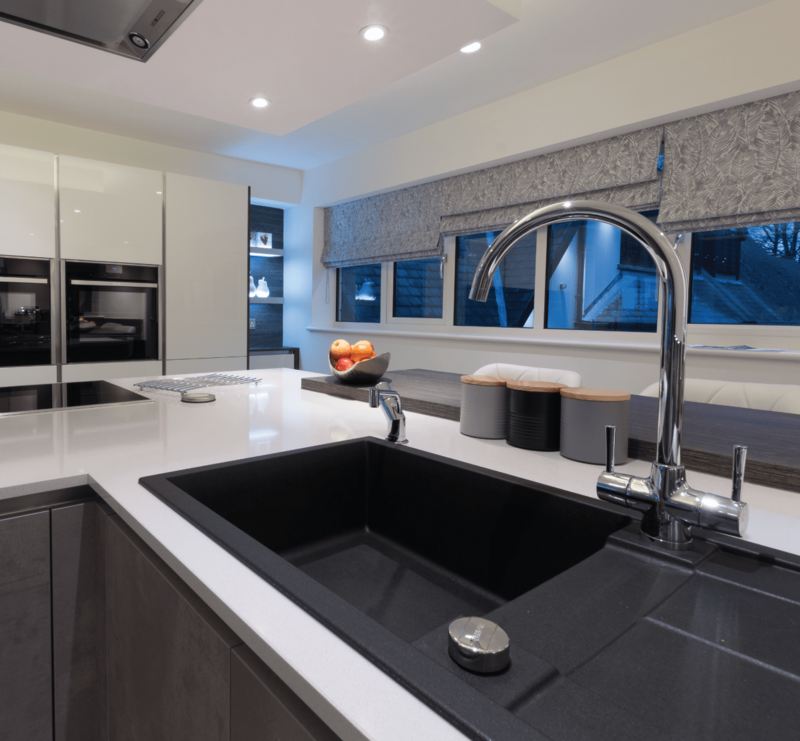 A simple palette of colour and texture is on display – the gloss, soft-touch of warm white cabinets is complemented by textured putty concrete on the kitchen island, whilst a large bowl granite sink provides a contrasting texture to the quartz worktop. Finally, this style is offset by the wood textured laminates on feature panels and a breakfast bar that looks inward towards the dining area. 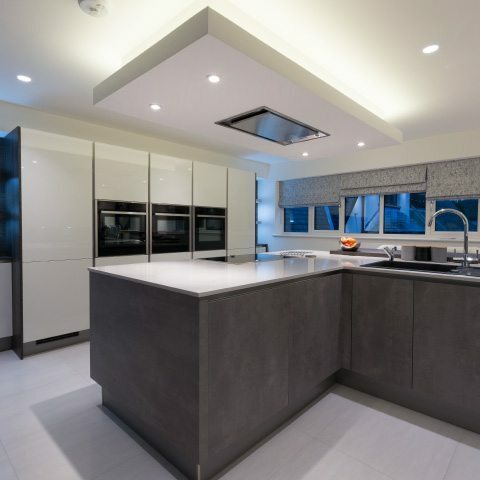 The open-plan, continuous design of the kitchen means that Melissa doesn’t have to remove herself from social situations when cooking or serving and clearing, which was one of the major points highlighted in the original design brief for her Rawtenstall property. Of all the design elements in Melissa’s new kitchen, the breakfast bar is by far her favourite. “It’s a fantastic social space because the breakfast bar faces the whole room. It’s a nice touch, it feels just right and is exactly what I wanted,” she says. 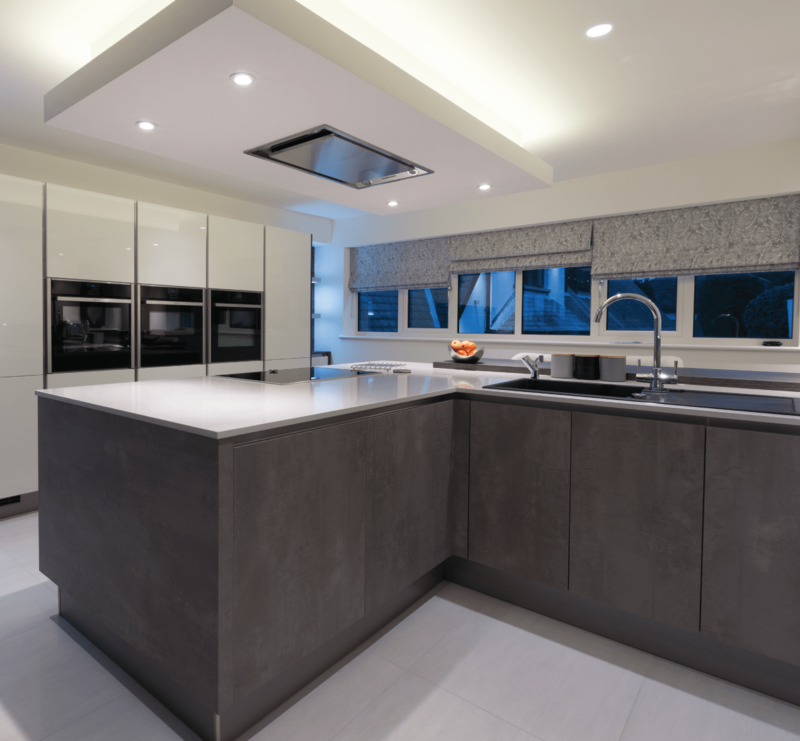 Melissa found a perfect partner in Kitchen Design Centre, who delivered everything she wanted within budget without compromising on quality. 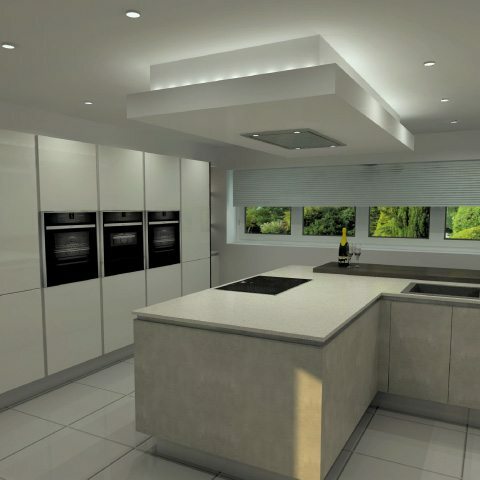 "The design team at Kitchen Design Centre are fantastic. Roger and Diane produced lovely artwork and reassured me throughout the process. The results speak for themselves – it’s a wonderful room and an excellent use of the space." 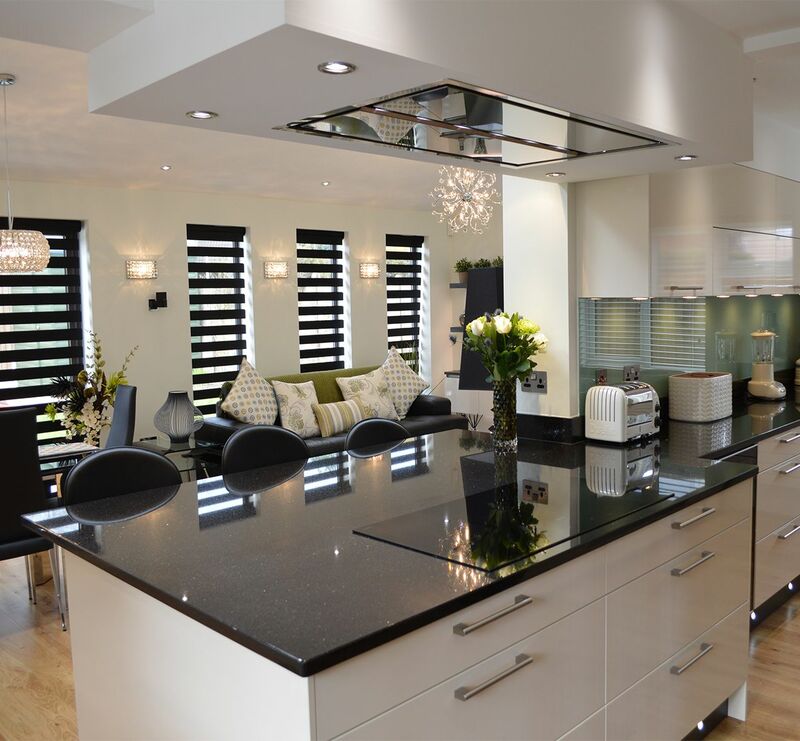 "When we sat down to discuss the brief with Melissa, it became clear from the outset that one of our showroom’s displays provided an excellent point of reference for our requirements. 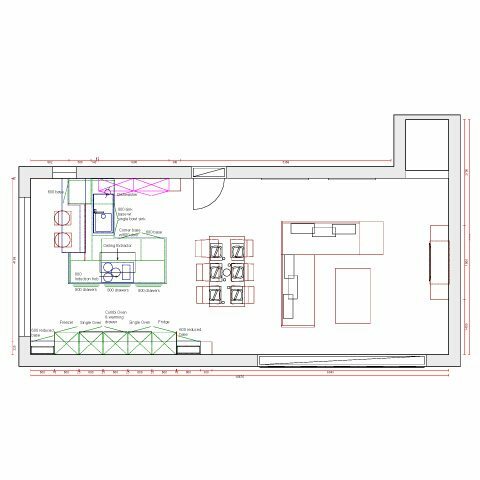 From here, we sketched out our ideas and variations which went into the final design for her Rawtenstall property. This, like the display she loved, included a beautiful balance of materials and textures. It was a pleasure working with such an open-minded client, and ultimately the whole thing came together beautifully."